I love my mom but I’m about to call her out on a strange favourite food of hers. Wendy’s baked potatoes. I think we only ever went to Wendy’s maybe a half dozen times in my whole life. We were more of an A&W or McDonald’s fast food family. But, I distinctly remember that she would always get the cheese and broccoli baked potato from Wendy’s. It does seem somewhat healthier than the rest of the menu when you think about it doesn’t it? This isn’t personally a favourite from my childhood but gosh I think my mom would love it. This cheese sauce recipe is from Fat Free Vegan and is made mostly from cauliflower. So much healthy than the original melted orange plastic cheese but with all the flavour. Cook the potatoes in the oven for around 40 minutes at 400°F. Meanwhile, make the sauce. Add the cauliflower, water, onion powder, garlic, paprika, mustard, and turmeric and bring to a boil. Cover tightly and reduce the heat to low. Simmer until the cauliflower easily comes apart when poked with a fork, about 15 minutes. Pour the sauce back in the saucepan. Bring it to a boil and continue to simmer until the sauce has thickened, up to 10 mins. Remove the saucepan from the heat so it can thicken a bit more. While the sauce thickens, steam the broccoli florets in a medium saucepan. 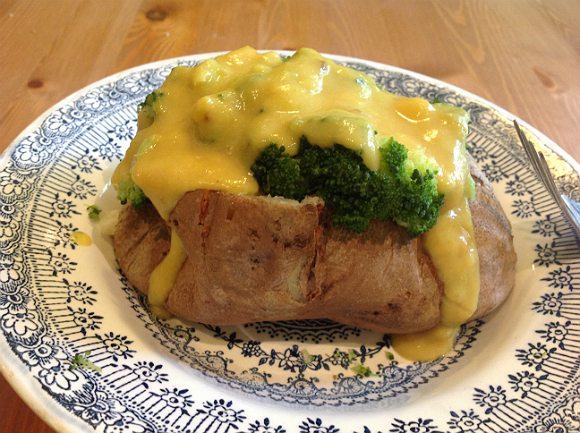 Once all of the components are cooked, split open the potato and top with broccoli and cheese sauce. Enjoy with a knife and fork. Keep the cheese sauce on standby for a mid potato top up.